Resources. Cleaning the planet of electrical pollution one home at a time. Find Out More. Be Informed. Make Choices. Here we list some resources that will help you understand more about dirty electricity, its origins, its causes and its effects on health. If you have found any interesting resources that you think we should know about then please send us the details through the Contact Form. A behaviorioural disorder, usually first diagnosed in childhood and more often in boys than girls. It is characterized by inattention, impulsivity, and, in some cases, hyperactivity. For more information please see the Wikipedia ADD/ADHD article. An SI unit measuring the strength of a magnetic field. Also known as "magnetic flux density" or "magnetic induction". For more information please see the Wikipedia Tesla article. Char Sbraggia, R.N. District Nurse, Melrose-Mindoro. 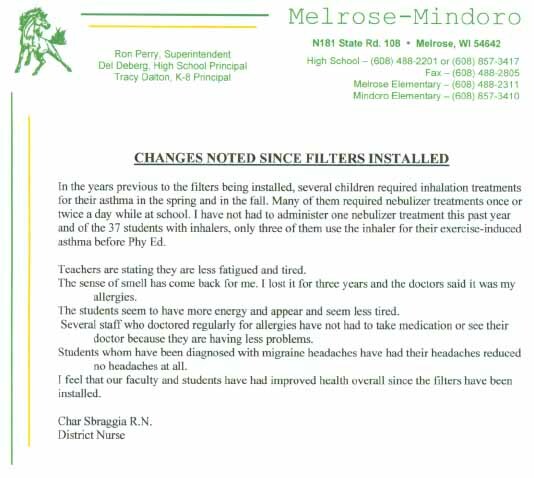 In the years previous to the filters being installed, several children required inhalation treatments for their asthma in the spring and in the fall. Many of them required nebulizer treatments once or twice a day while at school. I have not had to administer one nebulizer treatment this past year and of the 37 students with inhalers, only three of them use the inhaler for their exercise-induced asthma before Phy Ed. Teachers are stating they are less fatigued and tired. The sense of smell has come back for me. I lost it for three years and the doctors said it was my allergies. The students seem to have more energy and appear and seem less tired. Several staff who doctored regularly for allergies have not had to take medication or see their doctor because they are having less problems. Students whom have been diagnosed with migraine headaches have had their headaches reduced no headaches at all. I feel that our faculty and students have had improved health overall since the filters have been installed. 16 June 2003, By Lloyd Morgan, unpublished. "It is our supposition that not everyone is sensitive to peak values of dirty power. It is our hypothesis that there is an allergic type of reaction that some people have and others do not. Further, we have observed that those who become sensitive, over time become hypersensitive, not unlike some known allergies (e.g., bee stings). Conclusion: The data presented strongly suggests that Dave Stetzer's blood glucose is changed by exposure to dirty power. Further, for 2 out of 3 individuals blood glucose is also changed by dirty power. We believe that this data is sufficient to warrant a formal study to determine if exposure to dirty power electric fields does in fact raise blood glucose levels in sensitive people. We do not believe that all people are sensitive to dirty power anymore than all people are sensitive to pollen, cat dander and other allergenic agents". January 2007, By Dave Stetzer, Stetzer Consulting LLC. Includes a biographical sketch of Dave Stetzer and his report and analysis of electrical measurements from a classroom at Aquinas High School in La Crosse Wisconsin. Completed at the request of a parent of a student attending the school who had arranged the financing of filters to be installed in the school. The parent had reported that there were 4 cases of lymphoma at the school, which was statistically significant. Research shows that cancer and leukemia is associated with exposure to high frequency energy. 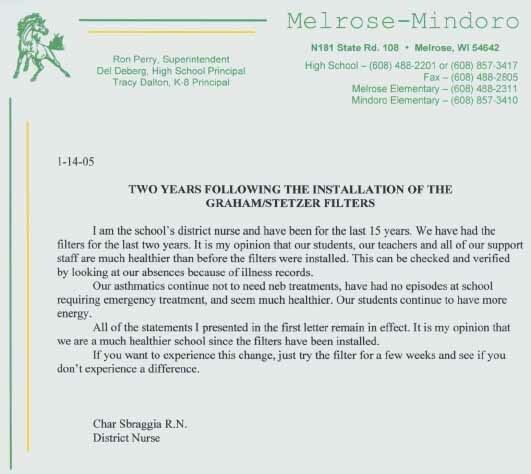 (EPRI, 2005, California Health Department 2002) Although the exposure to RF energy was significantly high on the wires within the building at Aquinas High School they were drastically reduced when the Graham/Stetzer filters were installed. When Thomas Edison began wiring New York City with a direct current electricity distribution system in the 1880s, he gave humankind the magic of electric light, heat, and power; in the process, though, he inadvertently opened a Pandora's Box of unimaginable illness and death.Dirty Electricitytells the story of Dr. Samuel Milham, the scientist who first alerted the world about the frightening link betweenoccupational exposure to electromagneticfields and human disease. Milham takesreaders through his early years and education, following the twisting path that led to his discovery that most of the twentieth century diseases of civilization, including cancer, cardiovascular disease, diabetes, and suicide, are caused by electromagnetic field exposure.Dr. Milham warns that because of the recentproliferation of radio frequency radiation from cell phones and towers, terrestrial antennas, Wi-Fi and Wi-max systems, broadband internet over power lines, and personal electronic equipment, we may be facing a looming epidemic of morbidity and mortality. InDirty Electricity, he reveals the steps we must take, personally and as a society, to coexist with this marvelous but dangerous technology. Find this book at Amazon. After writing Silent Fields: The Growing Cancer Cluster Story: When Electricity Kills... which highlighted the dangers of electromagnetic radiation on human tissue, Donna Fisher was still haunted by the ever-increasing incidence of breast cancer. She continued in her quest to investigate more fully the darker side of electricity, which led her to the surprising discovery that there is a secretive and subtle underlying menace, in all probability one cause of the dramatic increase in cancers: 'dirty electricity'. Donna Fisher believes that dirty electricity threatens the wellbeing and health of everyone, a stance that is often met with initial disbelief. This book will leave you in no doubt that we do indeed have a plague of pandemic proportions on our hands. It was when a school teacher helped a qualified and highly distinguished doctor finally gain access into a USA school to investigate why there were so many cancers that results showed what international scientists have known for decades: dirty electricity is killing people and making some very sick. The results of this study, together with information from leading experts in this field indicating how computers could increase the risk of breast cancer so significantly, were too much to ignore and Donna was prompted to investigate why it is now suspected that dirty electricity is the major contributor to many illnesses and cancer. The electrical environment in our homes, workplaces, schools and hospitals has become toxic. It is imperative that we take personal responsibility to clean the electricity we live with every day. Pregnant women especially must take the necessary steps to protect their unborn child. Donna Fisher explains that we are not hopeless and that there are constructive and simple things we can do in our homes right now to protect ourselves and our families. This book may be the most important book you ever read. It may even save your life. Very recently, new research is suggesting that nearly all the human plagues which emerged in the twentieth century, like common acute lymphoblastic leukemia in children, female breast cancer, malignant melanoma and asthma, can be tied to some facet of our use of electricity. There is an urgent need for governments and individuals to take steps to minimize community and personal EMF exposures. 2008 Samuel Milham, MD, MPH Medical epidemiologist in occupational epidemiology. Find this book at our Order page. It is hard to believe that the common use of electricity, up to now, part of the march of civilization and an integral part of our lives can kill. It need not be so insists Donna Fisher if proper scientific measurements are made of just when electricity becomes “dirty” and causes sickness and death. It is so that there is now more than just a tenuous link that breast cancer as well as childhood leukaemia can be caused by Electromagnetic Radiation in small doses. Donna Fisher at once informs us about the growing cancer cluster story and challenges us to confront certain authorities playing with the lives of people. This cancer cluster cover-up may well become the single biggest cover-up since the cigarette companies spent billions to deny that smoking was linked to cancer…. denying even that it had a tenuous link to the disease. There is only one physiological disease – the over–acidification of the body, due primarily to an inverted way of eating and living. This over–acidication leads to the one sickness, or primary symptom – the overgrowth in the body of microorganisms, whose poisons produce the symptoms we call 'disease'. In this landmark book, Robert O. Becker, M.D., a pioneer in the field of bioelectric science, presents a fascinating look at the role electricity plays in healing, challenging the traditional mechanistic model of the body. Colorful and controversial, this is a tale of engrossing research, scientific and medical politics, and breakthrough discoveries that offer new possibilities for fighting disease and harnessing the body's healing powers. An adaptation of the author's previous text: Electrical Stimulation and Electropathology (1992). Covers fundamental physical and engineering principles of short-term electrical exposure and emphasizes human reactions. New chapter discusses standards for human exposure to electromagnetic fields and electrical current. Halftone illustrations. The brochure will be available in more languages shortly. The document will be available in more languages shortly. "The Electric Power Research Institute (EPRI) is the only organization in North America funding long-term, multidisciplinary EMF research. To ensure objective results, EPRI carries out much of this research through sponsorship of independent scientists affiliated with major universities, laboratories and consulting organizations. Research findings are published in peer-reviewed journals. In addition, an external, blue-ribbon scientific advisory committee provides guidance for the EMF program's research activities." "In keeping with its mandate to conduct scientific research for the benefit of societies throughout the world, EPRI is continuing the search for answers to questions about EMF and health." "Frequently Asked Questions About Electric and Magnetic Fields (EMF): Environmental Issues". EMF Health Assesment and RF Safety article. EPRI lists a lot of useful on-line sources on its EMF Information Packet 2008 page.It also has a list of New EMF Studies. For the opinions of experts world-wide on the effects of electromagetic energy on health. "The possible health effects of powerlines, microwaves, radars, radio and TV station towers, cell sites and cell phones are of serious concern to many people round the world. The Environmental Health evidence is that the effects are real." The World Health Organistion perspective on electromagnetic energy and other related issues The WHO on Electromagnetic fields. Online Q&A: What are the health risks associated with mobile phones and their base stations? The website of the International Commission for Electromagnetic Safety ecems.eu.